TORONTO (Reuters) - The Canadian dollar weakened to a nearly four-month low against the greenback on Friday as oil prices extended recent declines and a court ruling threatened to delay construction of a pipeline carrying heavy crude from Canada to the United States. The price of oil, one of Canada's major exports, fell for the 10th straight day, the longest losing streak since July 1984, as global supply increased and investors worried that oil demand growth could slow. U.S. crude oil futures settled 0.8 percent lower at $60.19 a barrel. "The drop in oil is a kick in the teeth for the Canadian dollar," said Adam Button, chief currency analyst at ForexLive. "The Canadian dollar was able to withstand the pain in oil for most of the last month but oil is down 22 percent now." A U.S. judge in Montana late on Thursday halted construction of the Keystone XL pipeline, throwing another obstacle in the path of the project that has been in development for a decade. "The Keystone ruling can seriously derail the expected recovery next year in Canadian oil," Button said. Still, speculators have cut bearish bets on the Canadian dollar to the lowest since March, data from the U.S. Commodity Futures Trading Commission and Reuters calculations showed. As of Nov. 6, net short positions had decreased to 2,632 contracts from 9,655 a week earlier. At 4:02 p.m. (2102 GMT), the Canadian dollar was trading 0.4 percent lower at 1.3205 to the greenback, or 75.73 U.S. cents. The currency touched its weakest level since July 20 at 1.3233. For the week, the loonie was down 0.7 percent. 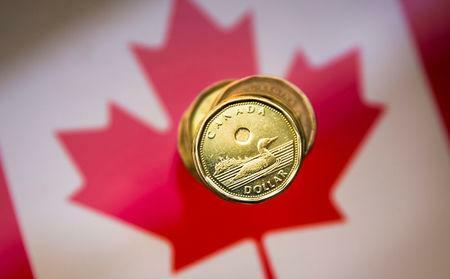 The loonie fell on Friday as weak Chinese data raised concerns about global growth, pressuring stocks on Wall Street. Canada runs a current account deficit, so its economy could be hurt if the flow of trade or capital slows. The U.S. dollar rose toward a 16-month high against the euro as falling equity prices spurred a flight to quality and the U.S. Federal Reserve reaffirmed its monetary tightening stance. Canadian government bond prices were higher across a flatter yield curve in sympathy with U.S. Treasuries. The 10-year rose 25.5 Canadian cents to yield 2.507 percent.